"I was digging in the garden when I heard it: a strange, wild, singing on the wind"
For some reason, that line captured my full attention, and raised my expectations for what would follow-I definitely wasn't disappointed. Albeit, the plot was slow-moving and focused more on build-up, the writing made up for it in a big way. Amy's words were full, and imprinted such vividly beautiful images onto my brain. The characters played nicely into the beauty of the story, I was quick to become attached to Lucy and her aunt Norrie. Their secluded life on an island was very briefly described, but I felt Lucy's need to have more SO strongly that I was pretty much bursting with joy when she finally discovered a way off of it. After that, the characters that entered the plot of Chantress were few, but I appreciated it. I felt like that gave them the chance to be fully explored and developed. Nat and Penebrygg were also characters that implanted themselves into my heart, and as their relationship grew with Lucy, I only grew to love them more. The attraction between Nat and Lucy was refreshingly slow on the uptake- THANK YOU AMY BUTLER GREENFIELD. You clearly understood the abundance of insta-love in YA these days, and nipped that bud QUICKLY! This book is the first part of a trilogy, I LIKE knowing that although this installment was a little slow, I get a chance to see characters develop even more within two more books. 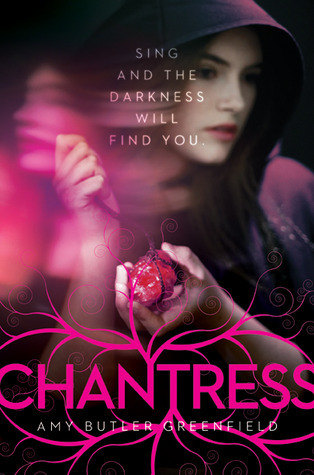 Overall, the Chantress was a great idea for a story, and definitely provided me with something completely new. And the writing...oh my word, I wish I could go on for paragraphs about it. Many have found, and probably will find, that the plot line drags a little in this book. But if you're anything like me, and appreciate the time it takes to craft a fantastic world and characters, you'll love what Chantress has to offer you. Amy Butler Greenfield was on her way to a history Ph.D. when she gave into temptation and became a writer. Among other honors, her books have won a PEN/Albrand Award, the Veolia Prix du Livre Environnement, and a Beacon of Freedom Award. 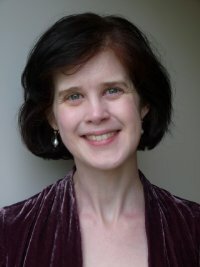 She loves music, romantic adventure, history, quirky science, and suspense, which explains how she came to write her first YA novel, Chantress, due out from Simon & Schuster in May 2013. Thank-you to the Shane @Itching for Books for hosting this tour, and to Margaret K. McElderry Publishers for sending me a copy of the book! I really enjoyed this one. It was definitely a slow moving novel. It seemed to be a building block story, bringing us into the world and teaching us the things we needed to know. I just have this feeling that the next book is going to be incredibly fast-paced. A no more hand holding kind of story! I'm glad you liked that first line. I love writing like that - but it's being stamped out a bit nowadays, for containing passive voice, "ing" words, etc. Tragedy. It's great to see that this book has great word building and character growth. And there's no insta love which is another bonus. I'm adding this book to my TBR pile and hopefully get to read it soon. Loved the review.